A slide launcher in the SSE. Slide Launchers are common stage elements found mostly in the Subspace Emissary in Super Smash Bros. Brawl. They are found on the ground in different stages in the SSE, such as jungle areas, cave areas, and even inside buildings and factories, and are about the size of the character. Characters can ride on them by simply jumping on them. As characters take their shielding position while riding a Slide Launcher, Yoshi rides them in his egg form. Slide Launchers appear initially in the Skyworld stage, where Mario and Pit can use them to travel quickly across the stage. Slide Launchers can serve both helpful and harmful purposes. They are sometimes situated where there is a large gap, and the player can use the launchers to make it across the gap with ease. They also guide the player to where he or she needs to go, especially in The Great Maze. However, some Slide Launchers launch players into harm's way. In The Subspace Bomb Factory II, there is one that launches the player into jets of fire, unless a switch has been hit beforehand to deactivate the flames. Others sometimes launch characters into Jyks, especially in The Swamp. In this level, there are launchers that shoot the player off of the stage and near the blast line. Depending on the difficulty, launchers can propel the character slowly or they can propel the character very quickly and farther of a distance. On the higher difficulties, some of the launchers are used as obstacles to throw the character off balance or off course. On the easier difficulties, it is possible to jump off the launcher before it activates. There is one launcher that appears outside of the SSE; in Target Smash! Level 3, there is a launcher that is placed in front of where the player spawns. This launcher shoots the player to the upper-left side of the stage, where the first targets are located. Any character can jump off a Slide Launcher immediately after landing on one to avoid being launched. 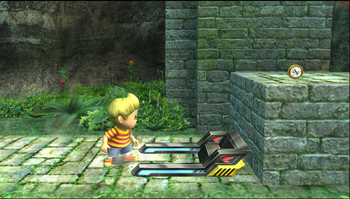 While Slide Launchers are an original addition to the Super Smash Bros. series, objects similar to Slide Launchers have also made appearances within other games. Slide Launcher-like objects can be found in the Kirby series, most notably in Kirby Super Star, with these counterparts also having the character take their shielding position before being launched. This page was last edited on April 9, 2017, at 16:43.